The presence of characteristic fine folds is important for modeling realistic looking virtual garments. While recent garment capture techniques are quite successful at capturing the low-frequency garment shape and motion over time, they often fail to capture the numerous high-frequency folds, reducing the realism of the reconstructed space- time models. In our work we propose a method for reintroducing fine folds into the captured models using data- driven dynamic wrinkling. We first estimate the shape and position of folds based on the original video footage used for capture and then wrinkle the surface based on those estimates using space-time deformation. Both steps utilize the unique geometric characteristics of garments in general, and garment folds specifically, to facilitate the modeling of believable folds. We demonstrate the effectiveness of our wrinkling method on a variety of garments that have been captured using several recent techniques. 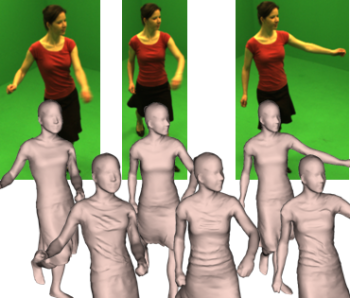 From left to right: input video and captured smooth geometry, estimated folds from the video images, and final wrinkled models. 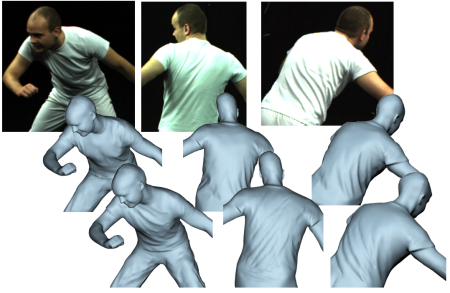 Video Based Fold Estimation: To generate folds consistent with the captured garment motion we take advantage of the available video footage and use the video to guide fold modeling. Our method first analyzes the video capture to estimate the position and shape of folds, using their distinguishing shape characteristics. Fold Modeling: Our method then introduces the folds into the reconstructed models, using stretch-minimizing deformation, which naturally produces believable fold shapes. We use a novel space-time deformation framework to generate folds which are consistent across time. Wrinkling dresses captured by [BPS08], (top) video input, (middle) captured geometry, (bottom) our results. Wrinkling a t-shirt and a jacket captured by [BPS08], (top) video input, (middle) captured geometry, (bottom) our results. Wrinkling outfits captured by [dAST08] (left) and [VBMP08] (right): (top) video input, (middle) captured geometry, (bottom) our results. The captured geometry on the left contains template folds which remain constant throughout the sequence. In contrast, the folds in our outputs change dynamically following the character's motion.